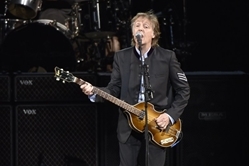 Paul McCartney plays concert at New York's Grand Central . Beatles Radio: The Beatles, Solos, Covers, Birthdays, News The Fab 4 and More! Commuters with tickets to ride out of New York’s Grand Central Station heard a special serenade on Friday evening, with Paul McCartney taking over a corner of the majestic hub for a concert.